By Lauren Corba. Apr 3, 2014. 9:00 AM. Marguerite Ann Johnson was born in St. Louis, Missouri on April 4, 1928. When she was three years old, her parents divorced, sending both Maya and her brother, Bailey, to live with their paternal grandmother in Stamps, Arkansas. Here, she was exposed to the harsh realities that African Americans faced in the South; however, her time in Stamps introduced her to the rich Southern African-American culture and community. Her grandmother instilled profound values and resilience in the young Maya, which would pervade her writings and make her the woman she is today. When she was about seven years old, Angelou and her brother returned to their mother in St. Louis. 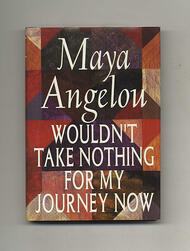 At the time, her mother was living with a boyfriend who would later sexually abuse Angelou. She confided in her brother, who then informed the family of Freeman's transgressions. He was taken to court. Freeman was found guilty--and served only one day in jail for his crime. Several days after he was discharged, Freeman was found dead—presumably murdered by Angelou’s uncles. Being so young, she believed that her words had the power to kill Freeman and was traumatized. From this ordeal, Angelou refused to speak for almost five years. Through her silence she was able to open her mind to new things, allowing her imagination to grow. She read classics such as Shakespeare, Edgar Allan Poe, and Charles Dickens, in addition to reading contemporary poetry written by women of color. At the age of fourteen, Angelou moved to Oakland, California with her mother and attended the California Labor School for dance and drama. Before graduating, she received a job as the first African-American streetcar conductor in San Francisco. When Angelou was seventeen years old, she gave birth to her only child, Clyde (Guy) Johnson. In 1949, despite the disapproval of interracial marriage in society at the time, Maya married Greek electrician and aspiring musician Anastasios Angelopoulos. She continued to dance, taking classes, forming groups, and performing at various venues in San Francisco. In 1954, her marriage with Angelopoulos failed, and Angelou took a job singing and dancing professionally in night clubs. She had various stage names; however, she was encouraged to use the name Maya Angelou as her permanent stage name due to its genuine “Calypso” sound. From 1954 to 1955, she toured Europe performing in the opera Porgy and Bess. With the connections Angelou made with the theatre, she was able to record her first album, Miss Calypso (1957) and in the same year performed in her first film—Calypso Heat Wave—in which she sang her own compositions. 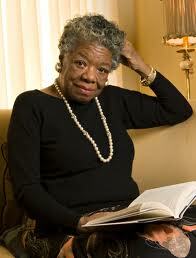 Angelou moved to New York in 1959, to concentrate on writing. There she joined the Harlem Writers Guild, where she met several African American authors and was published for the first time. She was introduced to civil rights leader Martin Luther King, Jr. and designed Cabaret for Freedom, which she would direct and star in to raise money for the Southern Christian Leadership Conference (SCLC). Angelou moved to Cairo with her son in 1961, after being inspired by the civil rights work she was doing in the United States. She worked as an assistant administrator of the University of Ghana’s School of Music and Drama while taking on editing and freelance writing jobs. She met Vusumzi Make, civil rights activist and lawyer, with whom she would develop a relationship with but never married. During the mid-1960s, Angelou left Africa and returned to the States to work with Malcom X and Martin Luther King Jr. on separate projects; however, both were assassinated, leaving their organizations behind and Angelou distraught. Upon moving home, Angelou rekindled her friendship with writer James Baldwin (Giovanni’s Room,1956), who encouraged her to share her life experiences through writing. And in 1970, Angelou’s first autobiography, I Know Why the Caged Bird Sings was published. The memoir quickly reached international success and she didn’t stop there. She continued to tear down barriers with her 1972 script for film, Georgia, Georgia. Her screenplay was the first ever to be written by an African American woman. She was nominated for a Pulitzer Prize for Georgia, Georgia and a Tony Award the following year for her role in Look Away. Angelou continued acting in films and television shows in addition to publishing several poems and a total of seven autobiographies including: Gather Together in My Name (1974) and All God’s Children Need Travelling Shoes (1986). Since 1982, Angelou has taught American studies at Wake Forest University. She remains active in human rights, speaking on behalf of both women and African Americans. Angelou has been presented with over fifty honorary degrees, several of them doctorates. Her legacy continues to inspire people across the world, bringing hope and determination to audiences everywhere. Maya Angelou passed way on May 28, 2014. Laur·en: of Florida origin—currently living in the Northwestern United States. Lover of language, horror films, literature, and cats—particularly fond of her own feline, Bagheera.